This is my third time of Japan self-drive on the road trip covering three regions, Chugoku (Hiroshima). Shikoku & Kansai. The total days is 9 days 8 nights. Parking in Japan – Parking in the hotel, elevator car park & self-service car park. Hiroshima Airport Review – Why it is better to land in Hiroshima airport than Kansai Airport. The above is only as a guideline, it depends on what type of meal you eat, where you stay and what type of rental cars you hire. Our hotel is about 3.5 stars to 4.5 stars. We usually have our meals in family restaurants which cost about 2000 yen (USD 18.00) to 4000 yen (USD 36) for three people. Most hotels offer complimentary breakfast and if the hotel does not provide breakfast, we have our breakfast bento in the convenience store which cost around 2000 yen (USD18.00) for 3 people. I started my trip from Hiroshima Airport and drive to Ononomichi, Imabari through Shimanami Kaido. Stay over in Matsuyama old town in Shikoku Island. Onomichi is a small quiet town before entering to Shikoku island. Those who do Shimanami Kaido cycling trip over to Shikoku Island will start from Onomichi town. We have a brief stop here for lunch. Onomichi ramen is a must try food while in Onomichi. The other things you may notice are lemon and mandarins are added into most of the snacks here. Best souvenirs to buy back are anything with lemon and mandarin, such as lemon tart and lemon jelly. Onomichi is also famous for its cat alley as the Cat Street View project went viral many years ago. 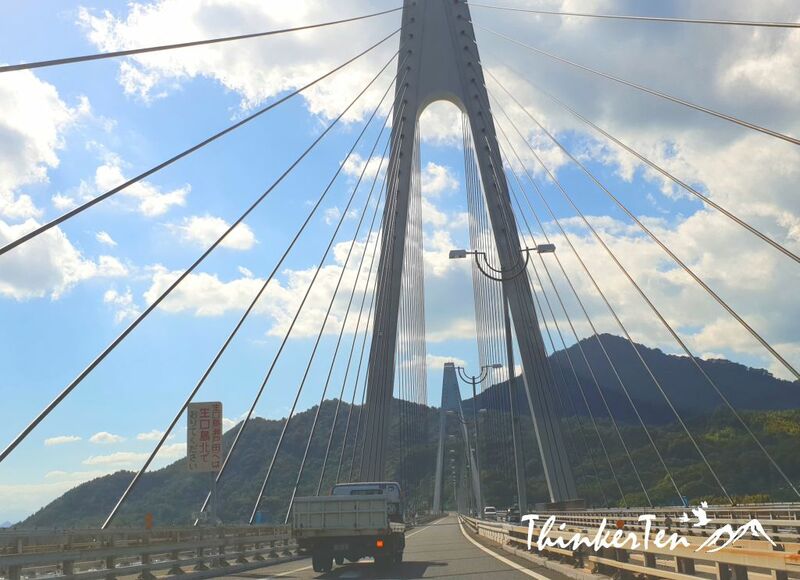 Shimanami Kaido is truly an amazing route connecting Japan mainland Honshu with Shikoku, passing over 6 small islands in the Seto Inland Sea which is famous for its lemon & mandarin citrus fruits. Glad that Lynn was able to share her cyclist experience in Shimanami Kaido route here as my experience was only by car ride. 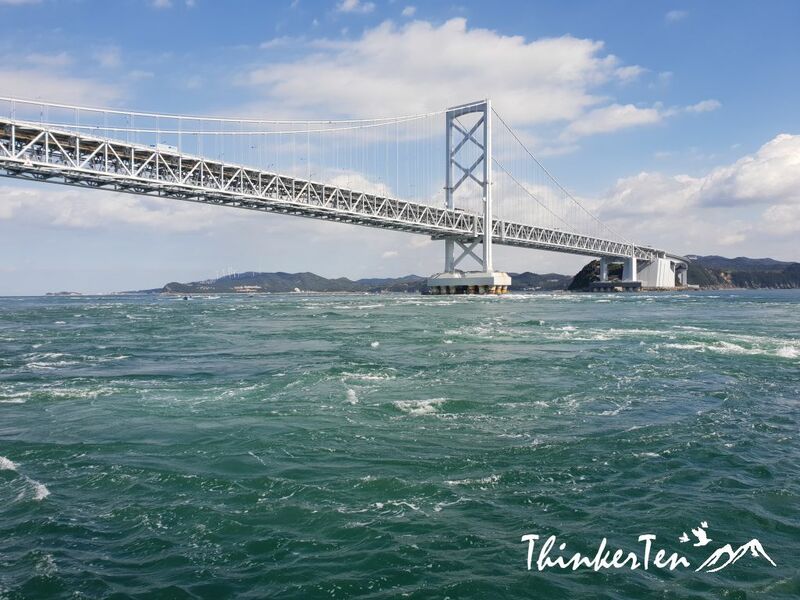 Do it by bicycle is still the ultimate way to go for Shimanami Kaido route if you have the time! 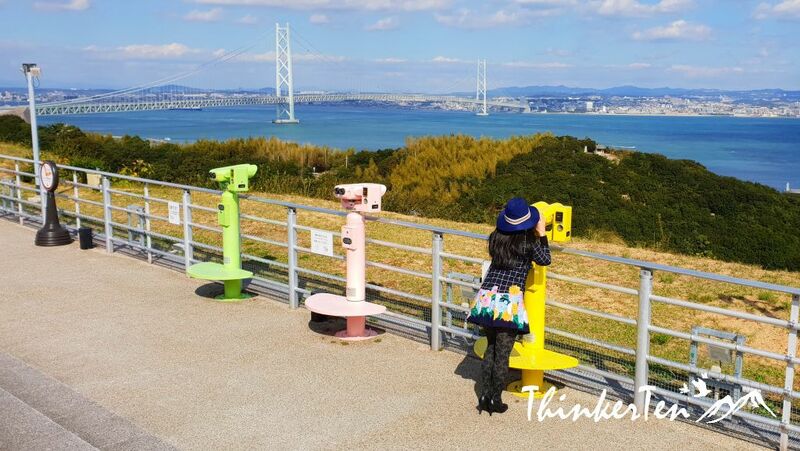 If you like to see how Shimanami Kaido looks like without any unblocked view/bird view, it is really worth to come up to Kirosan/Mt Kiro Observatory Park. It is just half an hour drive from Imabari. 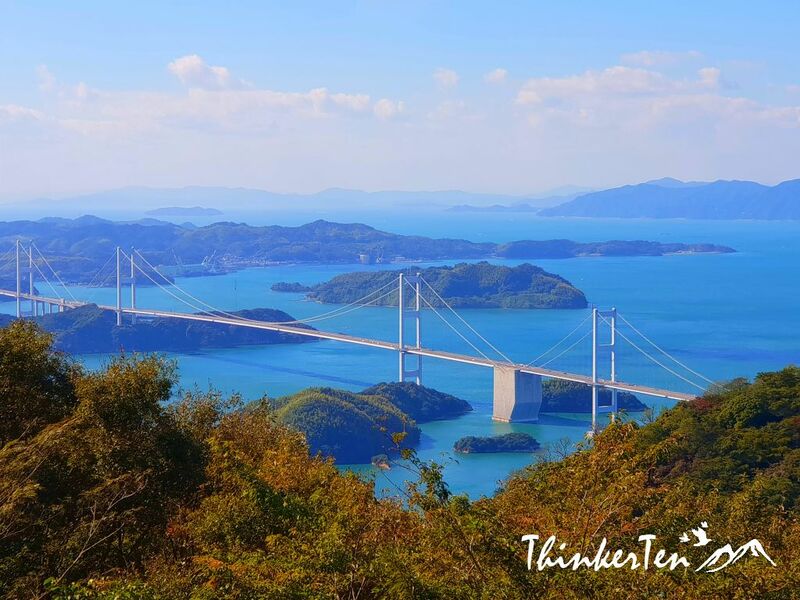 At Kirosan Observatory Park, you get to see the spectacular world’s longest suspension bridge Kurushima Bridge and also those little islands around Shikoku. Do remember to try the hand-made ice cream with a pinch of algae salt. Matsuyama city boost thousand years hot springs bathhouse called Dogo Onsen. Tourists flooded here to soak in the hot springs which are believed to cure disease and illness. What made the bathhouse stand out from the rest is, it has a special bath area dedicated only to the Imperial family. Another famous thing to note in Matsuyama city is Botchan by Natsume Soseki who is the top novelist in Japan and his best masterpiece is called “Botchan”. Every Japanese has read “Botchan” novel during their school years. Natsume Soseki is so important that he has also appeared in the 1000 Japanese Yen note. He was considered the most profound Japanese writer in the Japanese literature world. There is even a sweet called “Botchan Dango” and “Botchan Ressha” / Botchan Train named after his most famous novel. Do remember to try out the Botchan Dango sweet when you walk around in the shopping streets in your Japanese yukata/ bathrobe. Where to stay in Matsuyama city in Shikoku? Check out value for money Yukai Resort. Yukai Resort Dogo Saichoraku is Japanese style ryokan inn with onsen hot spring resort. 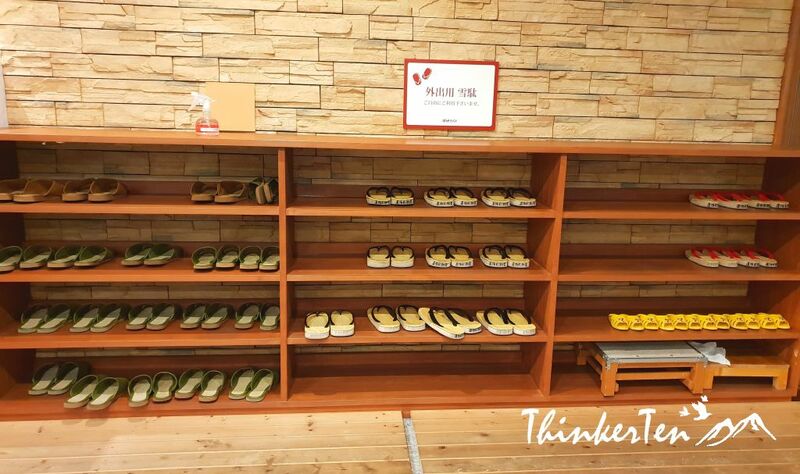 You have the opportunity to experience the traditional Japanese lifestyle such as sleeping on the futon /Japanese bed on the tatami mat floor. You will also see the Japanese paper sliding door with wood frame in your room. Japanese onsen bath is one thing you need to try but do watch out for the etiquette. Another thing worth mention here is you are able to experience most of the Japanese authentic dish in the dinner and breakfast. Konpirasan is famous among local and you do not see big tourists buses from mainland China or South East Asia. There are 1368 steps up to Kotohira-gu/Konpirasan, the mountain of happiness. During the Edo period, everyone is expected to visit at least once during their lifetime. Some who is unfit will send their dog to come up to do the pilgrimage for them so you see there are also many dogs visiting this shrine with their owner nowadays. The best time to visit should be in Autumn – mid-Nov onwards, you also get to see the red maple leaves in the backdrop. Sanuki Udon in Kagawa is one of the top food you need to try. If you are a budget traveler then udon won’t cost too much damage on your wallet. With only JPY 210 (USD 1.80) to JPY 600 (USD 5.30), you get to enjoy one of the best Sanuki Udon in Kagawa Prefecture in Shikoku Island, Japan. Sanuki is the old name for Kagawa Prefecture. The special characteristic of Sanuki Udon is its square shape and flat edges and also their broth is made from a type of dashi/soup base which differs from the rest of the other part of Japan. Plenty of free parking space too. Ritsurin Garden is Japan’s largest Cultural Property Garden that has been handed down since 400 years ago. It is true leisure to walk around these ponds and hills which were constructed beautifully. 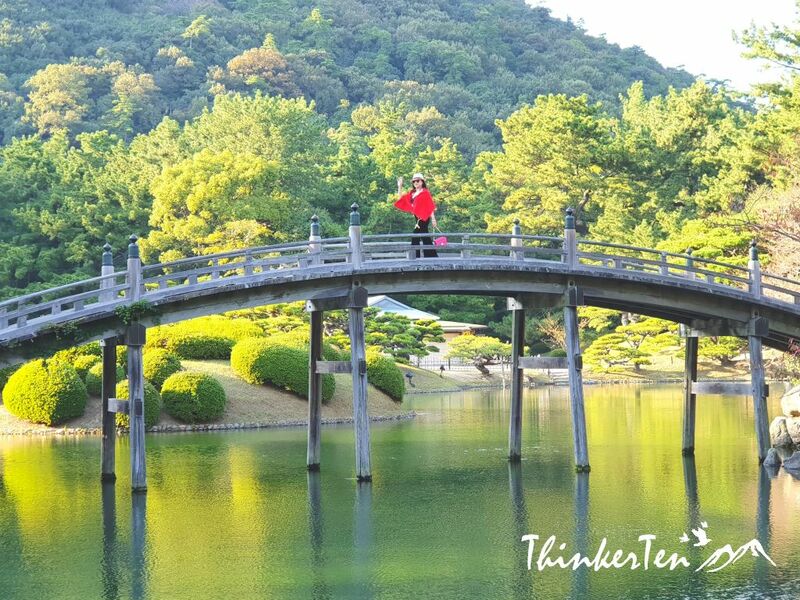 A “wasen” boat ride is another interesting way to explore Ritsurin Garden, you got to see a totally new perspective from walking the park’s path. No wonder this place is named as a Special Place of Scenic Beauty by the Japanese government. Touring in the local supermarket is really an enjoyable thing you can’t miss in Japan. With the advantages of self-drive, we have the luxury to drive to the local neighborhood and shop like a local. You will be surprised at how cheap things are in Japan. Click the link above to check out the local supermarket review. Bokaiso Hotel located at the top of Yashima mountain offer the breathtaking view of Seto Inland Sea. The room is extremely spacious and with sea view facing. The downside is there are no restaurants nearby so you may need to pre-book the in-house dinner or bring your own food up. Bakaiso is good for travelers who are driving so it is super exclusive. Questions: How many days do you need to spend in Shikoku? When you are doing a road trip to Japan with a rental car, you will encounter plenty of rest area along the highway. Visiting the rest area in Japan can be very interesting for both the locals and foreigners. This is because these rest areas are often more than a usual rest area that you see elsewhere. Not just the usual rest area with toilet break & fill up petrol; it also offers a variety of shopping for “omiyage” Japanese souvenirs, cafe & restaurants, observatory park with telescopes and big Ferris wheels. Click the link above to check out the facilities in Awaji Rest Area. 13. Den Den Town Osaka – The Animate Kingdom! 14. Kuromon Market Street Food Review – What are the must eat? When you are in Osaka, one of the places tourists like to visit is Kuromon Market, the oldest food market which has been around for over 170 years. Kuromon Market is located very near to Denden Town, Nipponbashi and Dotonbori, within walking distance. Hence you can do all together in half a day. Check out my food trail in Kuromon Market Osaka. Dotobori is the place for foodies and shoppers. It is best to come at around evening for dinner and check out the neon lights in this area. And yes, shooting a picture with a Glico Running Man is a must to prove that you are here. Taking a train in Japan can be complicated when you look at the countless lines on the map. But over here in Osaka is much lesser lines compare to Tokyo. Read about my experience is with JR (Japan Rail -also the biggest) and Osaka Subway. Special tip: Learn how to use fare adjustment machine at the exit of your destination. La’gent Hotel Osaka Bay is located next to Universal Studio Japan. We choose to stay here simply we wanted to stay away from the city area (half an hour drive to the city). Rates are usually higher at the CBD area and if it is within 5 mins walking from the train station. Since we have a rented car, we choose to stay outskirt to enjoy a cheaper rate for the hotel. This is another way to help you save money. Nara park is one of the best attractions to visit if you are in the Kansai area. It is located in the ancient capital of Japan, called Nara city. Why do I love so much about Nara Park? The answer is simple, there are over 1,200 wild deer freely roaming around in the park and including the nearby Todai Ji temple and Kasuga Shrine. The whole city of Nara is full of deer walking freely, co-exist with the human. Probably they think they are just like one of us. They don’t seem to be bothered and intimidated by the flock of tourists. Click on the link above to read about the top 14 things you may want to know before you head to the ancient Nara Deer Park so you do not miss out any important. Todaiji is a landmark in Nara, it is one of the most famous and historical temples which was built in 752 and now it is a UNESCO World Heritage Site. Todaiji is located near Nara Park and Kusaga Taisha Shrine so you also see a lot of deer wondering in this area as well. Click on the link above to learn about the 12 things before you visit Todaiji Temple. Biwako Hotel has located 12 km from the iconic Kiyomizu-Dera temple in Kyoto. If you are traveling to Kyoto and not knowing where to stay. I highly recommend the Biwako Hotel. The hotels in Kyoto usually cost more expensive and the rooms are very small especially if it is located next to the train station. If you are driving a rental car, why not drive further away from Kyoto and stay in similar price range hotel but offer a bigger room, free onsen bath, and a better view? You will be surprised at how spacious and how great the view is. You may want to include Kinkakuji (金閣寺, Golden Pavilion) & Ginkakuji 銀閣寺, Silver Pavilion in your Kyoto itinerary. The Golden Pavilion is always very crowded and not able to shoot nice pictures while the Silver Pavilion has fewer people. If you only have limited time and only can choose one, I would recommend you to visit the Silver Pavilion, simply it has more nature. Kyomizu Dera/清水寺 literally translated as “Pure Water Temple” which was founded around 780 AD and now being added to the list of Unesco World Heritage sites. 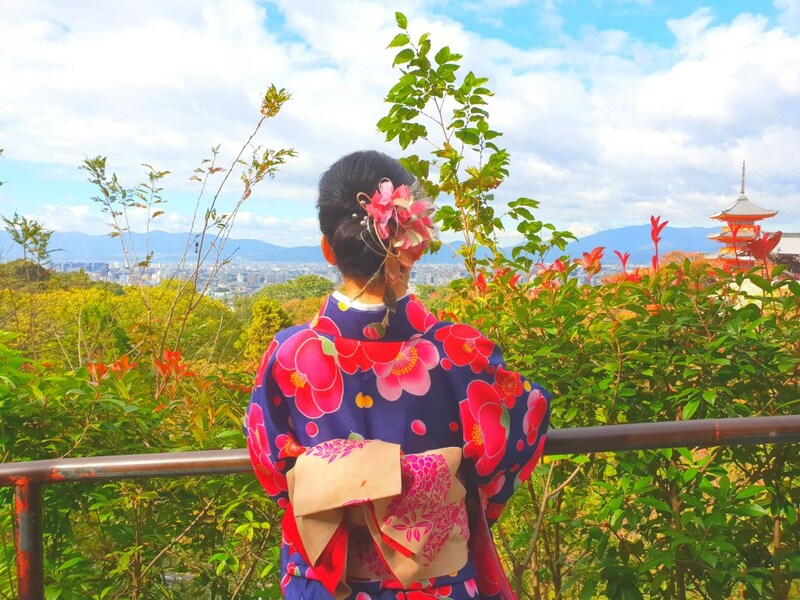 The one thing many like to do is explore this Kyoto in kimono. Why? Because of the ancient city matches well with kimono costume. Trust me. The one thing most visitors like to do in Gion is hoping to take a glimpse of the geisha or in Kyoto dialect, they called it “geiko”. They usually dressed in their traditional costume and with a white painted face, a red lip, and special hairdo. There are real and fake geisha or maiko in Gion district, the maiko in the below picture is a real one, as I followed her into a small alley and shoot this picture. Please do not follow them too near and do not act like a paparazzi but give them some space and shoot pictures from afar. 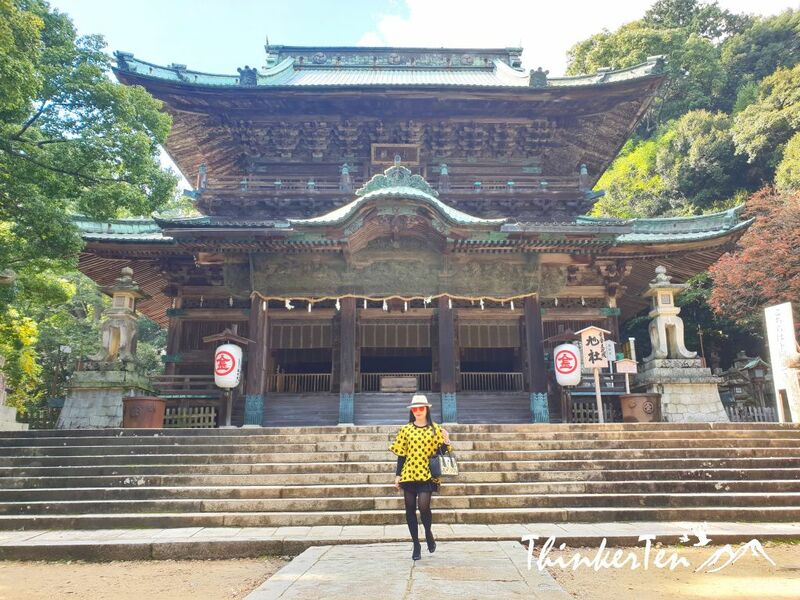 One way to learn more about Japanese culture while in Japan is to wear traditional costumes, be it kimono or yukata while strolling historical and picturesque streets. Kyoto would be the perfect place to do it. The kimono rental business is so popular and big here, the whole street is full of kimono rental shops. Just pop into anyone and ask them to transform you into Japanese doll. Fushimi Inari Shrine gets super popular after it appeared in one of the scenes in Memoir of the Geisha, a Hollywood movie. The thousand vermilion torii gates are the selling point here. Arashimaya literally means Storm Mountain/ 嵐山, located in the western outskirt of Kyoto. The Bamboo forest opens 24 hours so it is best if you could arrive at around 6 or 7 am, that way you could have the whole Bamboo Forest by yourself and experience the calm & peaceful atmosphere here. I arrived pretty late at around 10 -11 am but this place is already crowded with lots of tourists. Honestly, I don’t think the Bamboo Forest is that special at all, overrated. I have seen Bamboo Forest in Korea and China and I think they look prettier than this. Most importantly, fewer crowds! Tenryuji Temple is a must visit if you are in Arashimaya Kyoto, you can do it together with the Bamboo Forest as it is only located behind the temple. The buildings in Tenryuji Temple were burned down 8 times but the iconic zen garden landscape still remains the original and was built by Muso Soseki, the monk who is also a famous poet in Japan. If you wanted to check out the skyline of Osaka city, Umeda Sky Building is a good choice. Go up to the 40th floor and enjoy the open-air sky garden. The wind can be very strong so please be prepared. Oh yes, the “glass domed elevator” is an interesting ride up too. What do I like about Umeda Sky Building? I have a good look at the infrastructure from the top and most importantly it made me wonder why there are so many bridges in the Yodo River? Seriously I think there are overbuilt. The selling point for The Singulari Hotel Osaka Bay is it is within walking distance to Universal Studio Osaka. The hotel is literally right above the train station so it is very accessible. This is really a convenient hotel to stay if you are going to Universal Studio Japan. Another thing I love about is the Sky spa onsen hot spring, free for guest and a wide variety of breakfast choice. Miyajima is a small island which can be reached by ferry, less than 20 mins from the mainland of Honshu. Miyajima Island is so important that it is now a Unesco World Heritage Site. The island icon is the red shrine gate or “torii gate” of Itsukushima-jinja which was built in the water. The scene of the “floating torii gate” is one of the unique views in Japan. If you are staying in Hiroshima Airport Hotel do pay a visit to Sankeien as it is only located next to the hotel. You can walk over from the hotel. If you have an extra hour to spend while waiting for your flight, you may want to kill some time here at Sankeien Garden. Truly beautiful and many photo opportunities. When you travel to Japan, these are the food that you may want to try out. Where: Any Chuka restaurant in Japan. Just like Japanese Chuka/Chinese cuisine, Indian cuisine has adapted to suit the local palate. Indian cuisine in Japan is never too spicy. The Indian restaurants are all over Japan, usually run by foreigners; the Nepali or Indian as they are huge population residing in Japan. The menu is usually both in Japanese and English and the most important factors of all are super delicious and budget-friendly. A lunch set usually from 900-1400 yen (USD 8.10 -13.50). Since Indian restaurants are all over in Japan, pop in any restaurant you encounter and experience the Indian cuisine. You will like it, trust me. Where: Any Indian & Nepali restaurant in Japan. To combine the two means “grilled what you like”. This means that whatever you wish to have in it you can and put them to grill or cook with the flour. The flour is the key here. Osaka street food favorite is takoyaki/Octopus balls. We tasted Wanaka Takoyaki in Kuromon Market but I would rather suggest you try Takoyaki at Dotonbori as there are several stalls and more options to choose from. To me, Dotonbori is a takoyaki paradise. 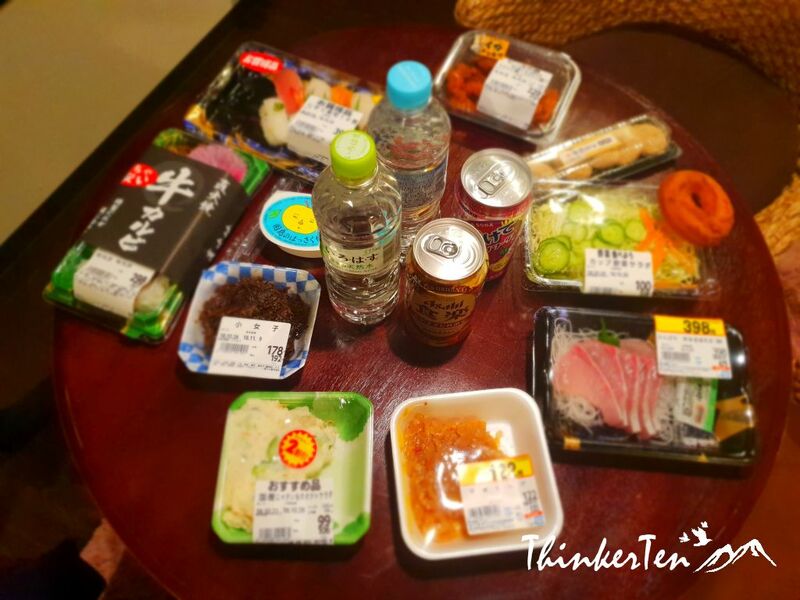 When tourists visit Japan, they usually don’t visit the local supermarket instead they dine at the restaurant. 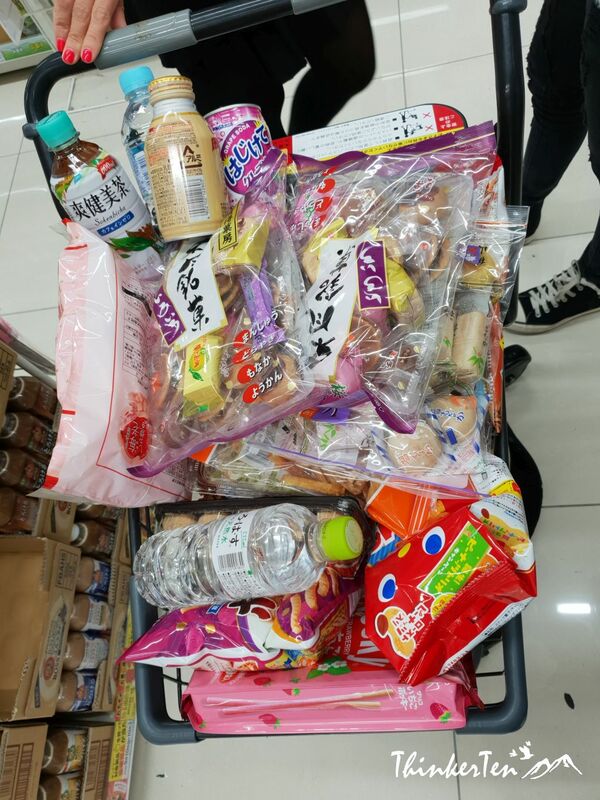 Visiting the local supermarket is one of the best parts of our travel in Japan. We love to see what the locals eat and use. We have discovered things in Japan actually is quite cheap, especially if you buy them in the local supermarket. One of the best places to find your breakfast is visiting the convenience store nearby. Japanese called it “Konbini”. You see convenience stores every few hundred meters apart. There are several popular chain convenience stores in Japan, such as Family Mart, Lawson and 7 Eleven. Each chain has its specialty to sell and attract their customers to come back. The special characteristic of Sanuki Udon is its square shape and flat edges and also their broth is made from a type of dashi/soup base which differs from the rest of other parts of Japan. Where: At Kagawa Prefecture Shikoku Island, any udon shop. Onomichi boosts their ramen. The ramen “dashi”/soup stock is made using chicken bones and small fish from the Seto Inland Sea with clear soy sauce base. If you have a group of 4 people – young children and old folks traveling together, it is best if you can rent a car and drive in Japan. Anywhere outside Tokyo is easy to drive. I was quite surprised that Osaka, being the second largest city in Japan is quite easy to drive too. Parking in Osaka & Kyoto area can cost more as compared to other cities. It looks like you had an amazing time! The architecture and landscape is simply breathtaking! Japan is on my travel wish list. Japan is a fascinating country to explore. It is best if you could self drive with a rental car. Not only it cost less but also so convenient and easy to explore. Wow this post really packs a punch! You covered everything here. Awesome job! I’ll definitely have to sit down with a mo in hand to re-read it. The pictures are absolutely awesome. It is pretty obvious you had an awesome time with your trip. I am quite jealous actually. It is pretty awesome indeed. The best season to travel to Japan is Spring and Autumn, the weather is super comfortable and the autumn color is just stunning. Went to Tokyo Japan in 2016 and it was the best place I have ever traveled to. Cant wait for a do over. Tokyo is the capital of Japan and the most populated area. Almost 90% of the population stay in Tokyo. Hope you can visit other parts of Japan, such as Kansai Region and Shikoku island. It has a lot to offer too. i am dying to go to japan. this looks os awesome, i’ll definitely be renting a car of we go so we can check out all these spots. Renting a car actually cost less in Japan especially if you have 4 pax traveling together. My dream country.Your photos are all on point and awesome.Nice blog.Hoping to go there soon. Japan is really a dream place to visit, full of beautiful scenery, culture and tradtition. The food are cheap and delicious too. It is indeed a lovely place to explore, Such great captures I must say that and your description is lovely and the food looks really. This part of Japan Kansai Shikoku and Hiroshima are very interesting and less populated as compared to Tokyo. In fact Nara and Kyoto are the oldest cities in Japan which you would not want to miss. i can’t believe i’ve never been to Japan yet, such a gorgeous country! Thanks a lot for the amazing review, going there soon i promise. Japan is one of the best destinations to travel in Asia, many people think it is an expensive country to travel but it is actually so much cheaper compared to Hong Kong and Macau. Such a beautiful detailing of Japan attractions. I would definitely like to visit it one day. And it would be icing on the cake if I would be able to drive down the cities because i am a road traveler and enjoy chatting during road trips. Traveling on a rental car is really easy and fun especially these days, we have the technologies with us such as GPS and google map. The drivers in Japan are pretty friendly and polite too. This part of Japan has fewer people if you were compared to Tokyo, the capital of Japan. Therefore it allows me to shoot some really nice picture without any photobombs. November is a great season to visit Japan, you got to visit the autumn colors. I love the red maple leaves turn red which made a really stunning backdrop for picture shooting. People usually include Hiroshima with Shikoku together if you have already been to Kansai region (Kyoto, Osaka and Nara). I knew very little about this guide and so was fascinating to read this. Wow, it seems you had a great time. And what a detailed description you have given. The pictures are so perfect. I wish I can travel there too soon. Thanks for your comment. It took me a while to compile this list and all the photos are mine and personally shoot it from these regions. Hope to inspire more people to visit this part of Japan as it is truly a hidden gem. You have convinced me that I have to travel to Japan. Whilst I have done research on Dogo and on the Shikoku region before, I never found such a complete guide. I do love making my own schedule so hiring a car would be my choice of transport as well. Japan however doesn’t seem like a very expensive country. Thanks for your comment. You can always reference to this guide and add in the other places or things you want to do in Japan. Japan is very cheap compare to a lot of other country in Europe, UK, America and Hong Kong. This looks so good. Your photos are awesome and really share the experience! Our family was at breakfast yesterday, and 3 out of 4 of us said if we could visit any country it would be Japan! I guess your family made a great choice, Japan is cheap to travel – refer to my costing for this trip which includes 4 stars hotel accommodation, food expenses, rental car, Unesco site entrance tickets. All cost very cheap compared to European and US entrance sites. It sounds like a dream Japan vacation. I wish I was there too. I will definitely put this on my next travel lists. I love Japan, but have never been to this destinations. Looks like a beautiful place and love your photos! Thank you for sharing such a very detailed post. Every season has its special unique thing to attract their tourists, even in summer too. There are plenty of summer festivals and firework happens in the summertime in Japan. I loved it when I made my trek out to South East Asia and visited China. Was beautiful. Japan is definitely on my bucket list of places to go. I will have to keep this saved when I do make it there. Glad to learn that you have visited SEA and China and hope you could make it to Japan one day. Japan really has so many things to offer, it looks so amazing. The photos are so awesome. Visiting Japan would really make my life complete..
Japan is really unique and it still remains of their old traditions hence it is pretty interesting, especially when you see local wearing kimono and walking around. That’s pretty cute. I would love to visit Japan someday. I took Japanese language class in college and I loved everything I learned about the country. I’ve never thought about renting a car when I travel abroad. I always assumed it would be too difficult, but it’s nice to know that you can navigate Japan so easily.